Our preliminary team seeding was 9th. Canada hasn't done too well on the international stage for a number of years so not many people expected much from our squad. Julien was the only seeded player in the individuals event seeded 13/16. The team did almost a week of pre tournament training in Mumbai before heading to Chennai for the big event. I was also supposed to be with the team, but had some major setbacks getting my visa. Let's just say if you have to get a visa to go to India don't use the courier service and avoid the Surrey BLS office by all means necessary. I had to get my flights changed because of the visa difficulties, so I didn't end up leaving Victoria until July 12th. I took a red eye to Toronto, had a 10 hour layover before taking a 9 hour flight to Frankfurt, a 6 hour layover there and finally a 9.5 hour flight to Chennai. Yes, I was wiped, but at least I made it. The team arrived the day after I checked into the hotel. This was my first time in India and it was quite a culture shock. I've traveled abroad before so I wasn't too taken aback by the traffic, pollution and lack of clean drinking water. The first tuk tun ride was quite the experience where our head coach, Jonathan Hill ordered an 'Uber' which to our surprise turned out to be a yellow tuk tuk (pictured below). They were a cheap and quick reliable source of transportation, if the driver knew where you wanted to go. When we first arrived at the courts to practice the outside temperature was almost 40 degree celsius. And there was no air conditioning in the club! Wow that was a tough first day on court. The Indian Squash Academy was really a beautiful facility though. They had 3 courts at the front of the club, a 4 wall glass show court around the back with another 4 newer glass back courts. I wish we had something like this in Canada. After a few days of practice and getting adjusted to the hot and bouncy courts the tournament was about to begin. Luckily for our guys the air conditioning did kick in and the temperature was not much of a factor the rest of the way. The morning of our first matches in invidious we had a player wake up ill and was quite sick, Somehow he went on to win 2 matches that day and must have hid it just well enough from his opponents. Even more surprisingly was that this was some of the best squash he would play all event. The individual draw was 128 for the boys. All of our 4 boys won their first 2 matches on day 1. Having 4 Canadians into the round of 32 was a big deal. The next day Julien, George and James all won again while Ryan lost to a 3/4 seed form Egypt in a close 3; with a weak ref and some fishing and blocking by his opponent. On to day 3 of the event and we had 3 Canadians into the final 16. This was big news in Canada and throughout the event. In the round of 16 Julien lost 11-9 in the fifth on his first match on the glass court to another top Egyptian seed while James lost to the Mexican #1 and top 90 PSA player in a tight 4 games. George I feel played the match of the tournament against the top seed and defending champion Marwan Tarek (pictured below) and lost in 4 on the glass court and for a moment in the fourth game I thought he looked the fresher of the 2 and had a real shot of pulling off the major upset. But Tarek showed his class and experience and pulled away in the fourth to close it out. After such a strong showing by our boys the seeding committee took notice and it was now between Canada and England for the #2 seed heading into the team event. The vote was unanimous and we secured the second seed and were poised to have the highest ever finish for our team in history; that is if our boys could recap the performances they displayed in their individual event. After a little break between the individual and team event we got our pool draw. We had Scotland (seeded 17) and Argentina (seeded 15) in our pool. We rested James for our first match and won dropping just a single game to Scotland. It was evident though that our boys were a bit edgy as many of them were playing on a team for the first time and representing their country and the World Championships. On day 2 we played Argentina and George came out a bit flat and nervous and went down 0 - 2 to the Argentina #3. Obviously we were all surprised after displaying worldclass squash against Tarek. It just goes to show how pressure and focusing on the result can negatively impact your performance. Luckily though George got it together and can back to win the next 3 games quite convincingly O next was Julien who had a tough match against their #1 losing in 5. So here we are down to the final match, if we lost this match we would play Egypt in the round of 16; no pressure James! Luckily James is a big time player and played at a top 5 level of all the juniors at the event. He sealed the deal and our team all had a big sigh of relief. I thought we were playing not too lose as opposed to playing to win. The mental game is so intriguing and really was a difference maker in many fo the closely encountered team matchups. 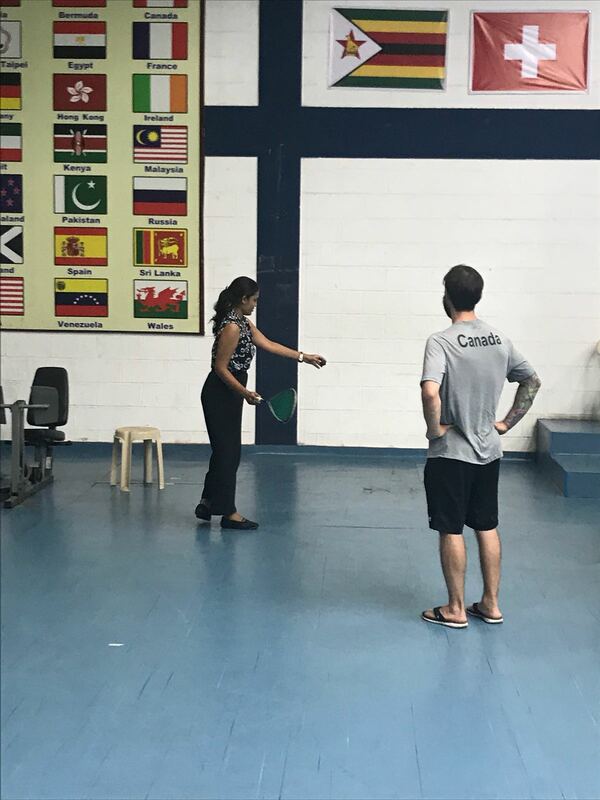 After getting through our pool we were drawn against Australia in the round of 16, a one time powerhouse of the squash world. All the boys played much better and we won all 3 matches. Next up was the quarterfinals against the US. James had beaten their #1 in the individual event in 3 straight games and Ryan had beaten their #3 while being sick in straight games too. So even though the boys were a bit nervous because of the occasion they were confident. This match started out with some major jitters. James who had been playing unbelievable so far went down 0 - 2 playing at the 2 position. All of the team members and coaches were a wreck with the ups and downs and mixed emotions from this match. I normally don't get nervous watching and coaching my kids play, but I most certainly was in this instance. After James won I started to relax a bit. We were up a match. Julien went on to play at the #1 position and was controlling the pace and most of the rallies. He was up 2 - 1 in games and 10-6 when he stretched for a ball int he back left corner only to slip and in that moment our whole team went into shock. After a delay of 2 or 3 sends Julien was down clutching his right hamstring in tears and we all looked at ourselves in complete shock. 'Did this really just happen?' We were all getting ready to celebrate, George was untying his shoes and Ryan about to text his friends to celebrate the occasion of a guaranteed medal and a matchup with England in the semis. Julien came off limping and it was clear immediately that it was serious. He only had 3 minutes to recover and go back and resume play. He got his leg bandaged but could not put any weight on his leg. The plan was to go back out up 10 - 7 and just go for a nick on the 3 return of serves and if he didn't get one default the match. He did actually hit one put it popped up just enough for his opponent to retrieve it while Julien was stuck watching from where he struck the ball from. As Julien hobbled off court George was now having to prepare to play a must win match. Meanwhile I was dealing with the physiotherapist and an in shock Julien. I had to take him to the tournament hospital for an examination. When I left it was 1 - 1 in the deciding match. I was in shock at the tournament thinking about what had just happened. I've never seen something like this take place and now here it is happening in the biggest match of our teams young squash careers. While waiting for Julien to finish his examination at the hospital I got the message that George has lost 12 - 10 in the fourth. He obviously felt terrible about letting the team down, but none of us blamed him because the pressure and the shock of that moment likely would have gotten the better of most players in that same position. We all got back to the tournament hotel around 10pm that night and had a team meeting and dinner. It started somber and we aired out some of our frustrations and disbeliefs. This is when Julien I think stepped up the most, he was the injured one and felt bad not only about being potentially seriously injured, but also for letting his teammates down when he was so close and sure of victory. 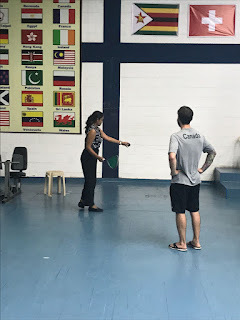 He stepped up and said the right things to get the team refocused as we still had to compete and we were scheduled to play the reigning World Champions, Pakistan at 11am the next day on the show court at the mall. That night most of us didn't sleep and when I did I dreamt of the nightmare that we'd just experienced. The next morning we were still in shock and now very tired. Luckily James was up first and he played pretty well, but lost a tight match to the #1 from Pakistan. Three of the games went to extra points so it really could have gone either way. We were in a hole here. One point away form a medal and now we must win the next 2 matches without our #1 player in the lineup. George was on next and did not come out sharp. It took a lot of encouraging to get him going as his confidence was fragile as he also felt like he let the team down the night prior. Thankfully Julien and Jonathan were able to get though to him between games and after dropping the first game came back to win in a scrappy 4. Now it was up to Ryan. His opponent was playing great squash and we ended up in a fifth and deciding game. Ryan got down 8 - 10 in the fifth and miraculously pulled it out 12 - 10. What a turn of events the team had gone through in such a short period of time. Somehow we sneaked that match out and now had a chance to finish off the tournament on a high note if we could beat the tough Malaysian team. On the final day of the event James was again on first playing as our #1 now and played amazing to win in 3. Ryan was a little off this day and lost in 3. Now it was up to George. Could this be his moment to pick the team back up in a big match? His opponent was skilled and it wasn't easy but George came through with a gutsy win in 4 to give Canada a fifth place finish. Fifth may not have been what we were expecting, but after what this team encountered in the quarterfinals it's pretty amazing that they were able to regroup and come back with 2 big victories. I think we all learned something from this event and that it really is never over until it's over and that pressure and adversity are sometimes our biggest opponents. It was a long 3 weeks for the coaching staff! During the entire last week of the event I was struggling wth some sort of illness, so I cannot wait to get home, drink some tap water and sleep in my own bed. It was overall a terrific, life changing experience for the whole team and I am very proud to have been a part of something so special. A big thank you to Jonathan for choosing me to be the team manager and for all of the boys for playing so hard and representing Canada so well. Will I go back to India anytime soon? Hmm I enjoyed everything besides the sickness so probably not. I did meet a lot of great people and someone even stole 1 of my Serious Squash shirts lol. 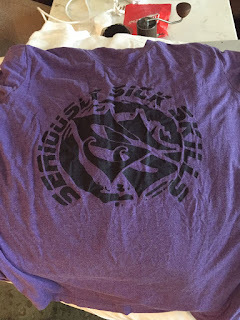 So if you happen to see someone wearing a purple Serious Squash shirt (pictured below) at your club ask if it's a medium and where they go it lol. And if there are more spelling and grammar errors in here than normal it probably has something to do with the lack of sleep I'm running on at the moment.